Can you believe it’s almost time to go back to school?! A new semester also means it’s nearly recruitment week. This time last year, some incoming-freshmen women messaged me asking about my experience joining a sorority while also being a Christian my first year of college. This post and video are more about someone who may be considering going through recruitment because they’re concerned about the balance of growing their faith in college, than about what I did to grow my faith in college (but I could definitely make a post about that as well). VIDEO: JOINING A SORORITY AS A CHRISTIAN? Is it a good idea? I’ve always been open about my sorority experience and role as an executive board member for my chapter last year, but I will say that this summer, I made the decision to withdraw my sorority membership entirely. It was not a decision I was expecting to make nor one I took lightly. I won’t go into too much detail about ‘why’, but I ultimately had to make some decisions to benefit my health and stress level. Sometimes, ‘no’ is the right decision and (like I learned from the Best Yes by Lysa Terkeurst that I just read) best decision for you. You don’t have to say ‘yes’ to everything and you don’t have to keep saying ‘yes’ to something that’s stealing your joy. Since I did join a sorority my first semester of college and was a member for two years, I did want to create this post and video about the question of balancing faith and sorority membership. The biggest thing I want to make clear from this post & video is that no matter what you get involved in in college or where you go to school, you will always have struggles in faith. You will be tested in your beliefs. And you will always have to decide to make faith a priority! While being in a sorority can add lots of commitments to your schedule and expose you to more of the ‘college experience’ (see what I mean by that in the video) than you might like, it’s ultimately up to you to grow your faith and find friends who share your beliefs! It actually amazed me when I realized just how many Christian friends I’ve found and made in college, without really searching for them. When Lent rolled around my freshman year, a bunch of my sorority sisters and I all realized were Catholic without having really discussed it before… It’s truly in God’s plan to give me some amazing Christian & Catholic friends! I made lots of Christian friends through my sorority, and while I have nothing against non-Christian friends, I’ve found that I am usually closer to people who do share my beliefs. In making these friends, it was great to go to mass together or talk about faith outside regular sorority events. I’m always pretty open about my faith and the fact that I go to church weekly, so I think I’m kind of a light for others who wouldn’t usually talk about their faith but know it’s something important to me. As far as balancing college life, sorority, and faith, it really is about finding a balance that works for you. I could definitely tell when my faith was lacking and feel the strain it put on me, especially when I constantly missed the Catholic student nights to attend a myriad of sorority events. There’s always going to be something else fighting for your attention, but you have to choose when you have to put your faith, or yourself, first. Even if it means cancelling, saying ‘no’, or cutting things out of your life. I posted on Instagram yesterday asking other women’s thoughts on this topic. 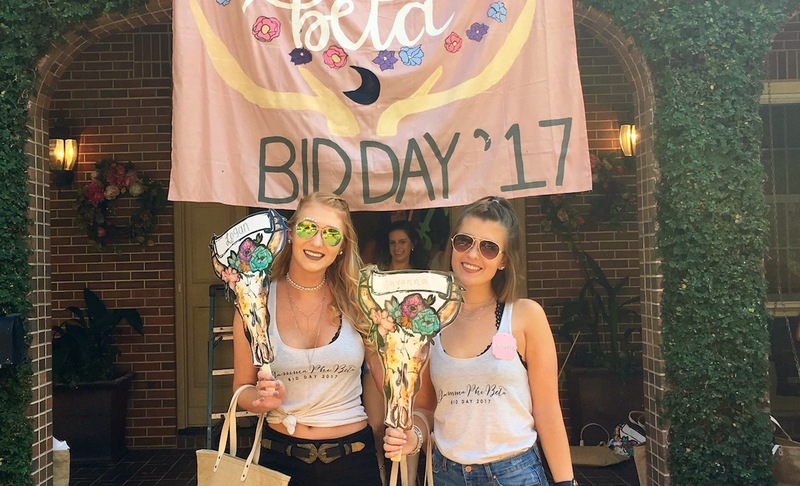 About half the ladies that responded actually withdrew from their sororities this summer too, which was surprising but oddly comforting… I’m not the only one! Although each and every one of them said that their sorority membership positively impacted their faith life throughout college, from Greek Bible studies to having extra friends to attend church with. If you’re worried about going through recruitment because you aren’t sure how it’ll mix into your life as a Christian, I’d still say go for it! Like I said, you will go through trials of faith regardless of where you go and what you do, so don’t let this hold you back. However, you will have to prioritize your faith regardless. It’s easy to get distracted by anything and everything else in college, but faith is the best and most beautiful rock to build your life around. I do not regret joining a sorority my first semester. My faith has grown beautifully throughout college, but definitely not by random chance! It’s taken lots of hard work and learning to lean on the Lord. I hope this post and video were insightful or helpful for you! Are you going through recruitment this semester? Did you have a similar faith & sorority experience? Drop me a comment below!